This book contains as many as 1,650 core TOEFL iBT/ TOEIC words along with synonyms, definitions, example sentences, and 29 different reviews provided by my colleagues and students. In order to help students preparing for the TOEFL iBT/ TOEIC to memorize the words more effectively, certain words have stars (*), which indicate the degrees of difficulty of memorizing them. 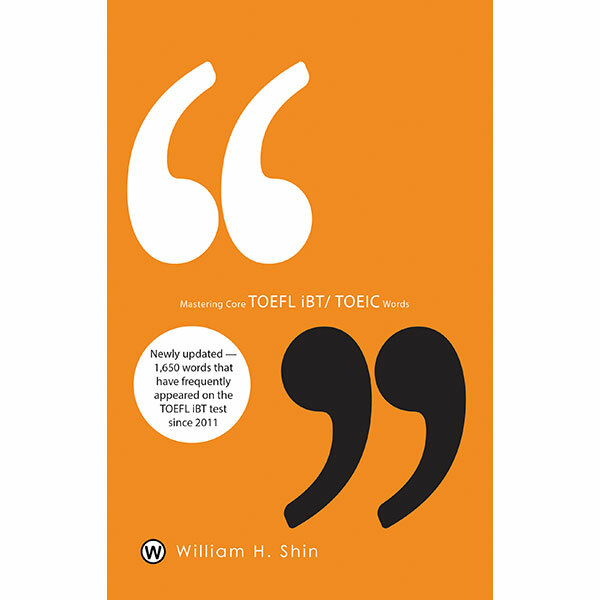 Based on Mr. Shin's long-term TOEFL/ TOEIC teaching experience, students preparing for the TOEFL iBT/ TOEIC must precisely learn the definitions of the core TOEFL iBT/ TOEIC words in this book to enhance their TOEFL iBT/ TOEIC scores. Once students have memorized all the words, they will be able to start dealing with questions from the reading, writing, listening, and speaking sections more easily and efficiently. This book will enable students to become better TOEFL iBT/ TOEIC test takers. William H. Shin is Founder CEO and Education Consultant of Knowledge Tree Education LLC. He is a SAT/SSA/TOEFL iBT instructor. He currently is the Academic Coordinator and ESL/TOEFL iBT Instructor (Reading, Listening, Speaking and Writing) at CAMPUS Education in Palisades Park, NJ.He has a Bachelor of Arts (BA) from Hankook University of Foreign Studies, Seoul Korea with a Major in Russian Language and Literature. He has a Masters of Arts (MA) from New York University, Graduate School of Arts and Science with a major of Russian and Slavic Studies and literature. Also from New York University, Steinhardt Graduate School of Education, NY TESOL in School of Culture, Education and Human Development. In addition, he has Matriculated in Advance Certificated Program at New York University with a major TESOL (Teachers of English to Speakers of Other Languages).